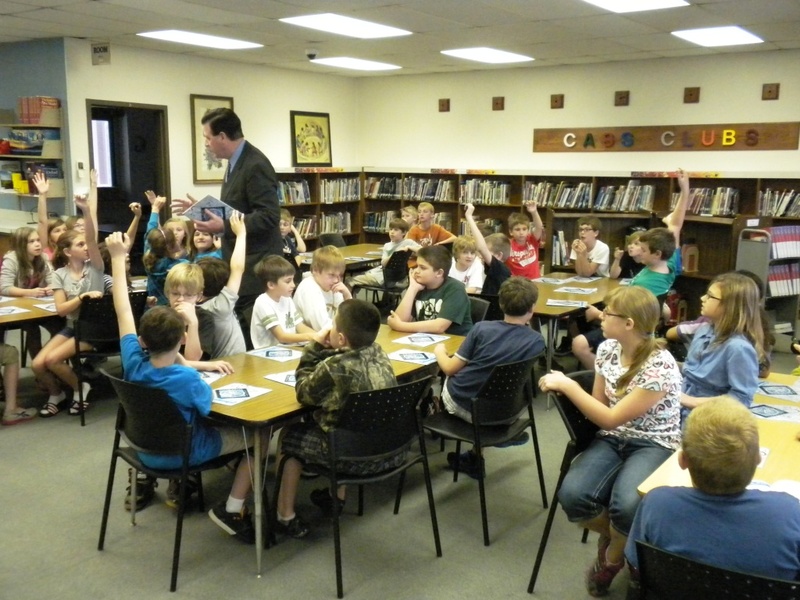 Fourth graders at Hayes Leonard Elementary in Valparaiso ask questions of Legacy Foundation CEO Harry Vande Velde during a visit to the school. A pioneer of early flight. Founder of the first major African-American record label in the United States. Fourth-grade students at Hayes Leonard Elementary School in Valparaiso are learning more about these innovators and 16 others by using a new activity resource provided by Legacy Foundation, Lake County’s leading philanthropic partner. The students gathered Wednesday in the school library with teacher Sharon McCorkle and other educators to celebrate the release of The Legends’ Compass: A Collection of True Tales for Young Adventurers and Dreamers. The Legends’ Compass is an activity resource based on innovators honored as South Shore Legends at the South Shore Convention & Visitors Authority/Indiana Welcome Center in Hammond. The resource, available as both a book and downloadable, printable pages, is designed to help children throughout Northwest Indiana be inspired by stories of people who grew up in their own communities and achieved great things. The activity book was written by a certified teacher and meets Indiana Academic Standards for fourth grade curriculum in Reading and Social Studies. “Legacy Foundation is proud to bring this educational resource to students, so that they can learn about the amazing accomplishments of the South Shore Legends in a fun and interesting way,” said Harry Vande Velde, president and chief executive officer of Legacy Foundation. Recently Legacy Foundation distributed 1,400 copies of The Legends’ Compass to fourth-grade teachers and others working with school-age children around the seven-county Northwest Indiana area. View the resource at www.legacyfoundationlakeco.org/southshorelegends. This sounds very cool! It is great that you are giving your students these kinds of experiences. We are educators on a mission to give more kids experiences that they currently don’t get within the four walls of their classrooms. Let us know what you think about our project and whether or not you would engage in international collaboration!